In 1982, our Club established a community food bank, now Feeding America Eastern Wisconsin. 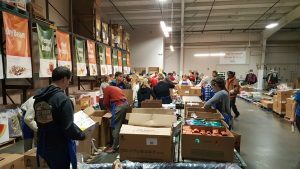 Feeding America has warehouses in Milwaukee and the Fox Valley and distributes more than 24 million pounds of food a year to over 800 pantries, meal programs and other nonprofit agencies that serves more than 377,000 people in eastern Wisconsin. Rotary continues its strong ties with Feeding America with Done-in-a-Day volunteer opportunities there twice a year. Our next volunteer day will be on Saturday, February 17th from 9:00 am – 12:00 pm. We will help sort food for those in need in our community. Sign up online or contact the Rotary office for more information. Rotarians and friends working together.